The V4 engine layout is synonymous with Lancia, the marque having employed the layout extensively from the 1920’s right up to and sometime after its demise as an independent in 1969. Founder, Vincenzo Lancia had something of a penchant for the vee-formation engine but it’s unclear exactly why he favoured the V4 over its in-line counterpart, given that the layout tends to fall prey to out of balance forces one would really rather not have to deal with. V4’s also tend to ladle complication and weight owing to the more complex cylinder block castings and additional valvegear required. Their principle advantage appears to be that of compactness, something Lancia’s engineers under the esteemed Dr. Antonio Fessia were specifically aiming for when scheming the Fulvia during the early 1960’s. 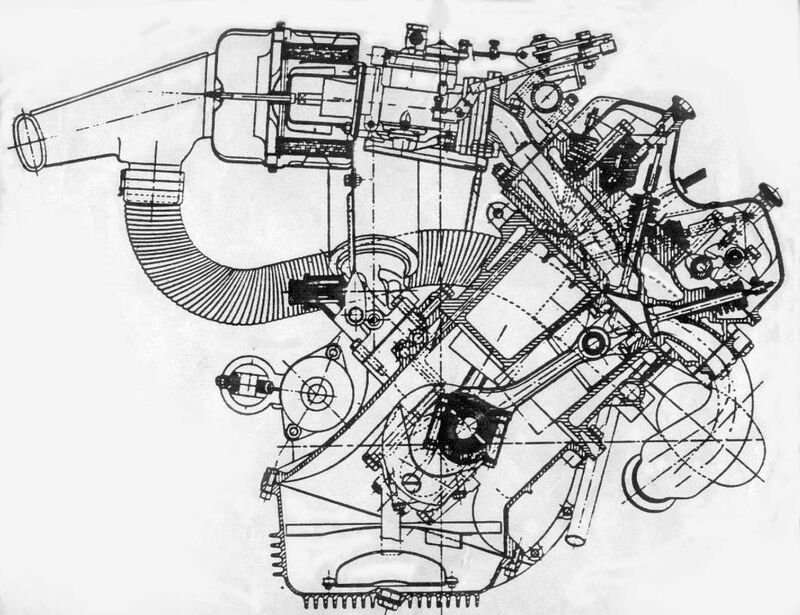 Dr. Fessia’s team had already created a new horizontally-opposed four cylinder unit for the larger Flavia model but although prototypes were built with a smaller capacity version of this engine, it appears they were not successful. Fessia imposed the use of the Flavia’s transmission unit which would not have been compatible with a standard in-line engine layout. So despite his edict that engineers should avoid anything overtly adventurous or expensive, Designer, Ettore Zaccone Mina, using his experience with the V8 Grand Prix engine, returned to Lancia’s roots. Generations of Lancia’s from the Lambda through to the groundbreaking Aprilia and post-war Appia employed a variation of the same V4 unit. The new engine was distantly related to the outgoing powerplant but was comprehensively redesigned – its inclined angle pared back from 20° to a mere 12°45’ on the initial 1091cc version. This incredibly narrow inclined angle allowed a single cylinder head casting to be utilised, and countered the rough-running associated with the layout. In typical Lancia fashion, no expense was spared in producing an engine of the finest calibre – one that the term ‘exquisite’ could really have been coined for. For an entry level model, this was an incredibly sophisticated power unit, featuring a twin overhead camshaft cylinder head and crankcase of die-cast aluminium; the cylinder block itself was made of cast iron. All major engine ancillaries were delicate aluminium castings – everything from the finned alloy sump pan to the cast alloy cam-covers machined and finished to standard not found on anything but the most exclusive hand-built machinery. Despite its layout, the Fulvia V4 had even firing intervals; its crankshaft designed with throws arranged to account for the inclined angle. Canted left 45° and angled back 6° for a low bonnet line and optimal centre of gravity and mated to a four speed in-line transaxle, the resultant power unit was both light and compact. Mounted ahead of the front axle line and attached to the body via a stout well-isolated subframe, it proved a delightfully willing, refined power unit, which propelled the sober-suited Fulvia Berlina to highly respectable velocities with Lancia’s characteristic excellence in steering, ride comfort and overall road behaviour. Engine sizes crept up steadily and as the Fulvia coupé carved out a name for itself across the special stages of international rallying, the need for additional power saw capacity rise to 1216cc. In 1967, the engine was revised further with a slightly narrower bank angle – 12° 45’ and a range of capacities, which rose to 1231 or 1298 cc. As the racing successes continued a final rise in capacity to 1584cc came about in 1969, with an even narrower angle of 11°20′. 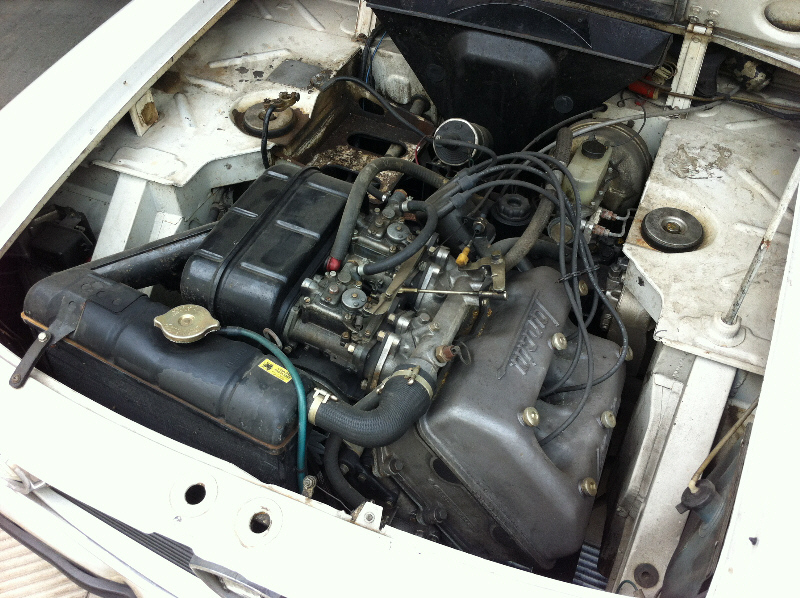 The 1.6 litre engine was not reputed to be as sweet-running as the smaller units and some have suggested it may have been too powerful for the body – some hard-driven 1.6’s suffering stress fatigue around the front subframe mounts. Like all Lancia engines, the Fulvia V4 was not tolerant of ill-use or ham-fisted maintenance. Special tools were required for several jobs and many Fulvia engines met their end at the hands of inexperienced or philistine mechanics. Because they were also favourites of the rallying fraternity, a great many Fulvia’s ended upturned in fields – plenty stayed there too. As an aside, it is reputed that during the mid-1960’s when Saab were looking for a compact powertrain to supersede their outdated two-stroke, they considered licencing the Fulvia V4, but opted instead for Ford’s more homely 60°unit instead. It’s difficult to argue that Saab made the best choice; sound it most certainly was, and given the reliability of the Ford unit, commercially successful. However it would mark the first of several engineering links between Saab and Lancia, to neither marque’s ultimate benefit. The last Fulvia was produced in 1976, Fiat having cheapened the car where possible in order to claw back some revenue on the loss-making model. Even its engine fell victim to the cost-accountants, but to the end, the little V4 sang as heartily and as sweetly as ever – even if its integrity was somewhat compromised. Its demise marked the end an ethos of engineering without regard to cost that saw the house of Lancia to their grave. DTW acknowledges: Technical detail via Lancia Owners Club article ‘Milestone Engines’ – with thanks. The narrow angle is mystifying as it approaches vertical. There must have been very specific reasons that this just-off-parallel unit was deemed optimum. It’s nice they did and makes me wonder how many other tailored, departures-from-the-obvious were evident in the car. Lancia’s engineers were not conforming to my stereotype of the breeze-block mentality that can characterise them. Lancia truly was a special firm, where engineering met an artist’s mentality: diligent and creative. Next Next post: Theme : Engines – The V6 Also-Rans.